Transform an ordinary sugar cookie into a fun, festive Christmas tree with green icing and a star on top! Line a cookie sheet with parchment paper or lightly spray with non-stick cooking spray. In a medium bowl, whisk together flour, baking soda, and baking powder. Set Aside. In a large bowl, mix together butter and sugar 1-2 minutes, until light and fluffy. Add egg and vanilla to the butter and sugar mixture, mix until just combined. Slowly mix in the dry ingredients until a soft dough is formed. 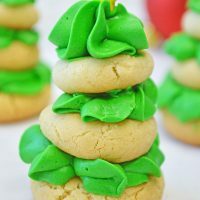 Roll the sugar cookie dough into small sized balls, create sets of 3 different sizes, one larger, one medium, and one small to create your tree. The biggest cookie should be about 1 ½ inches wide. Bake for 5-7 minutes, until cookies are turning golden brown near the bottom. Allow cookies to cool completely on a wire rack. In a large bowl, mix together cream cheese, butter, vanilla, and green food coloring. Slowly add powdered sugar, mixing well with each addition. Add more green food coloring, if necessary, to get your desired shade of green, 1-2 drops at a time. Add frosting to a cake decorator, or use a piping bag with a star tip. Add a small amount of frosting to the larger cookie, add the medium on top, and repeat to add the smaller cookie. Finish with one last bit of frosting. Add your star sprinkles to the top of your tree. Repeat for all of the cookies.